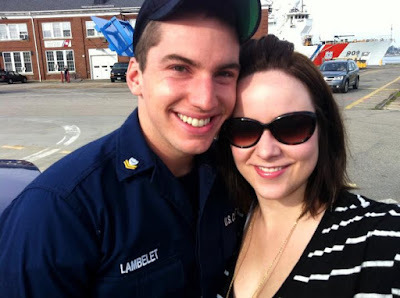 As you may recall, Nathan left for a month-long deployment early Saturday morning. I dropped him off on base & settled in to weather the storm alone. Decided that if my water/power went out & I needed to use the facilities, I could use the giant, empty cat litter tub I was about to throw in the recycling bin, & neutralize it with some clean litter. HURRICANE MACGYVER, I know. Remembered that I have 21 small bottles of liquor in the apartment, which I wanted to send to my cousin for her 21st birthday until I realized that's illegal. Storm rations! Watched a handful of terrible movies, including "Life As We Know It," "Revenge of the Bridesmaids," "Gothika" & "Sorority Wars"
In the end, all my precautions were for naught. The storm passed Portsmouth almost entirely, providing us nothing more than strong rain & weak winds. Know what's funny? The power went out at the Raddison where I had reservations, as well as with the inland friends I almost stayed with! How did you fare during the storm? Everybody OK out there?